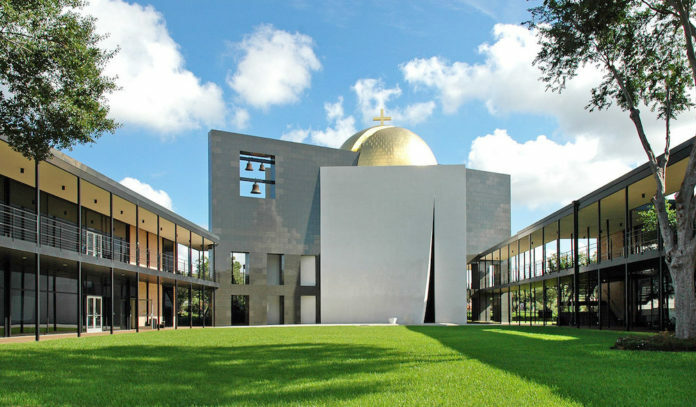 Discover modern architecture masterpieces in Houston by one of the city’s biggest influencers with our list of 10 favorite Philip Johnson buildings in Houston. Thought to be one of the architecture world’s most influential eccentrics, Philip Johnson has helped to define what we know today as Houston’s structural character. Starting in the late ’50s Johnson began to introduce our city to modern architecture, designing many noteworthy landmarks that both visitors and native Houstonians seek out to enjoy today. Check out our list of buildings that have come to grace Houston by way of Philip Johnson’s creative vision below. Pennzoil Place I & II – If you are ever walking around Downtown Houston and see a set of two 36-story towers that look like they could be connected, they aren’t. They are mirror images of each other, almost at kissing distance, and neither one is better than the other. Designed by Philip Johnson and John Burgee in 1975, the trapezoid-shaped towers are covered with bronze-tinted glass which adds a dramatic silhouette to the skyline. The two buildings are considered to have ushered in the era of postmodernism and were once coined “the building of the decade” by The New York Times. Rothko Chapel – Commonly known as one of the most sacred spots in the city, the Rothko Chapel is an octagonal brick building that serves as a spiritual space and public forum. Renowned art collectors, John and Dominique Menil of The Menil Collection commissioned famed abstract expressionist painter Mark Rothko in 1964 to create a space for meditative paintings. Philip Johnson was the Chapel’s original architect but the plans eventually fell to the hands of Howard Barnstone and Eugene Aubry after differences could not be resolved. A trip to Houston without a visit to the Rothko Chapel is like no trip at all. Menil House – John & Dominique Menil’s Home – Coined the first modernist house in Texas, the home of John and Dominique Menil is an international-style house in the River Oaks area, designed in 1948 by Philip Johnson and decorated by fashion designer Charles James. The house was a shocking disruption to many neighbors who didn’t understand its long flat-roofed; one-story structure of brick, steel, and glass. As you can imagine from some of the country’s top collectors, the landmark is known for its art just as much as it is for its architecture. The house is full of modern art that rotates throughout the year. 50 years after its unveiling, the house underwent a three-year conservation project to return the house to how it appeared when the Menil’s spent their daily lives in the residence. St. Thomas University Academic Mall – Designed in 1957 by Johnson, the University of St. Thomas Academic Mall is laid out with two rows of open symmetrical buildings full of classrooms, anchored by the Chapel of St. Basil on one end and the Doherty Library on the other. The Mall focuses on academics, community, and faith with the classrooms facing one another to represent the constant dialogue between faith and reason. In the center of the buildings is a lawn that allows students to sit back, take a break, and enjoy the outdoors. Mixing his notable modern style with minimalism, Johnson designed a campus that put Houston on the map for international modernism. Chapel of St. Basil at St. Thomas University – Anchoring the St. Thomas University Academic Mall, the Chapel of St. Basil provides a quiet contemplative space for prayer and reflection on campus. It consists of white stucco and black granite material in three basic geometric shapes: a cube for the body of the church, a sphere for the dome, and a granite plane, connecting these shapes by intersecting both the dome and the cube. The Chapel was designed without a door to suggest that all people and faiths are welcome to meet their own God. Philip Johnson completed the Chapel in 1997 with the intention of maintaining a postmodern feel. It was the last work he designed in Houston. Williams Tower (previously Transco Tower) – In 1982, Philip Johnson, along with John Burgee Architects and Morris Architects, designed (at the time of its construction) the largest skyscraper outside of a central business district in the world. Houston’s most visible building stands tall in the heart of the Galleria at over 900 feet and on a clear night, it acts as a light beacon for all of Houston. Gerald D. Hines Waterwall Park – Facing south of the Williams Tower, the Gerald D. Hines Waterwall Park makes a huge splash as one of Houston’s most popular photographed sites and backdrops. 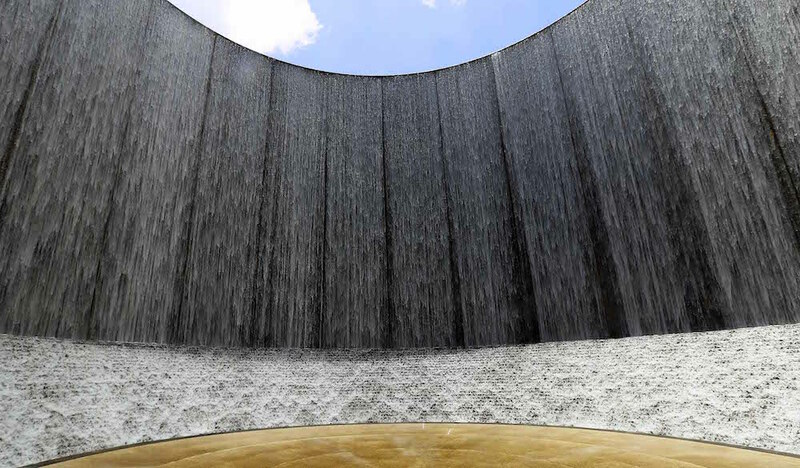 Created in 1985 by Philip Johnson and John Burgee, the waterfall is a 64-foot u-shaped sculptural fountain that pours water rapidly down its walls. Next to the fountain is a huge grassy three-acre area that contains over 180 live oak trees. The area serves as a community centerpiece in the Uptown District where many visitors come to enjoy a short walk, a picnic, or break from shopping at the Galleria. Post Oak Central – Post Oak Central is a 17-acre business and retail complex comprised of three office towers in the Uptown district. Johnson was commissioned to build the first structure in 1975, the second in 1979, and the third in 1982. The buildings’ architectural structures are made up of continuously-curved corners and alternating striped bands of glass and aluminum. Bank of America Center – Lighting up the Theater District at 780 feet tall with its dramatic gabled roofline and reflective glass is the Bank of America Center. The architectural duo of Johnson and John Burgee completed the Center in 1983 in a neo-Gothic design, combining past architectural styles with new postmodern vision. The 56-story office tower is thought to be one of the most defining features to Houston’s skyline. 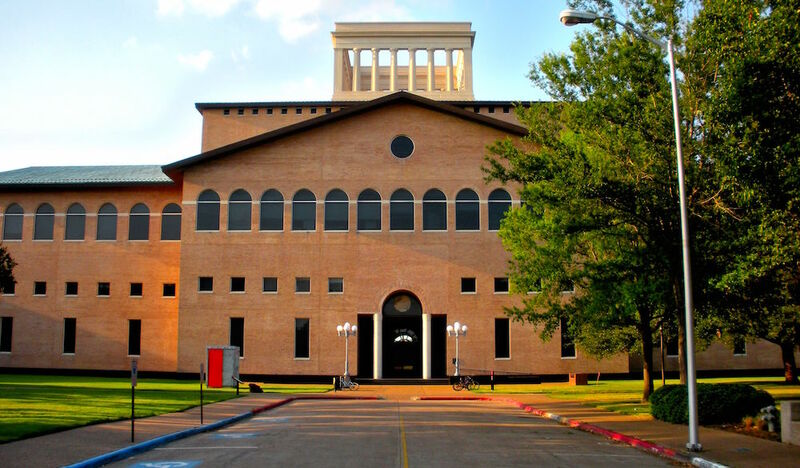 Hines College of Architecture at the University of Houston – Philip Johnson designed the Hines College of Architecture at the University of Houston in 1985 in true postmodern fashion. In architecture, postmodern can simply be defined as any architecture that is both functional and artistic. There is a kind of “anything goes together” aspect that has no limits. 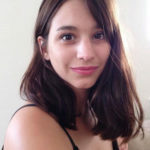 For example, the College of Architecture is modeled in a neoclassical architectural style and has four stories of design studios arranged around a skylit atrium. The structure boasts a white; open-roofed Parthenon on the top of the building that features a glass floor with a view down into the ceiling of the main building. The combining of an 18th-century classical design with a pure classical antiquity proves Johnson still had room late in his career to be unexpected.